The Big Blue Ball is coming! Do the winter months always leave you a little frigid? Finding the heat used to be difficult in winters passed. For all of the frosty receptions of the season, sometimes a little formality can help ease the tension and find a more relaxed state. Wait, what am I saying? Formal? Here? It can happen but only if it makes for things to be really, really hot. 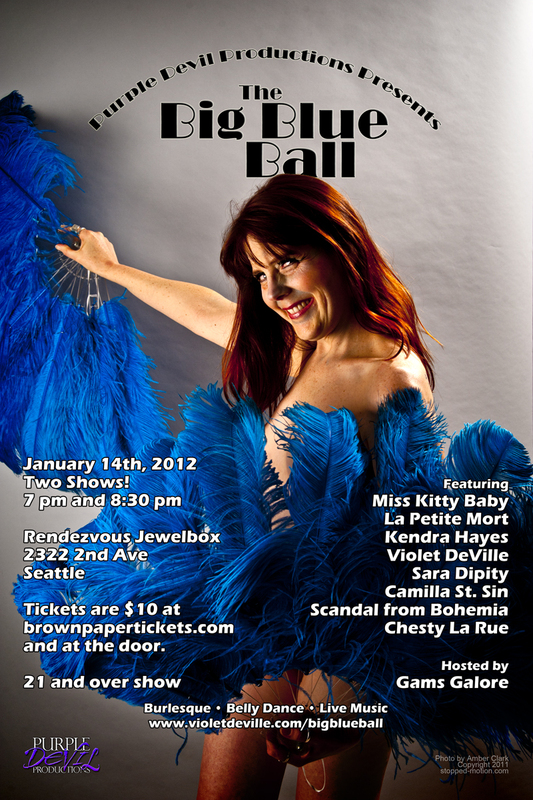 Purple Devil Productions presents The Big Blue Ball, an evening of burlesque, music, and belly dance to make these cold, cold nights hot again. ...and hosted by Miss Gams Galore! Tickets are $8 in advance through Brown Paper Tickets and $10 at the door. Feeling frosty? Come inside and let us warm you up. On September 24th, I will be heading back to school at the Tin Can Studio in Seattle and I get to do my class work with a grade A class of performers! Pack your No. 2 pencils and your Crayolas in your brand new backpack and head Back To School! Get an education in burlesque with the sexxxy stylings of Seraphina Fiero, Scandal from Bohemia, Betty Fish, La Petite Mort, Death Ann, Iva Handfull, and more! The show is $5 at the door and the show is at 8pm. The Tin Can Studio is located on 3130 Airport Way South, #510, in the old Rainier Brewery. I expect nothing less than perfect attendance from you all. See you there, my lovelies!